Francis is on sabbatical at the moment and is looking after the girls full time, while I'm at work. This means that when I race I tend to feel really guilty that Francis is with the girls on his own for yet another day. I'm incredibly grateful for his support so I can carry on taking part in events...but it means that I tend to focus on very local races at the moment. 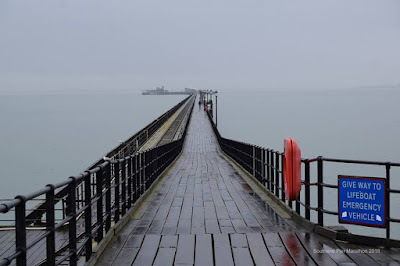 So when I saw there was a marathon being held up and down the Southend Pier, just 15 minutes from my house, I thought I should take advantage and sign up. 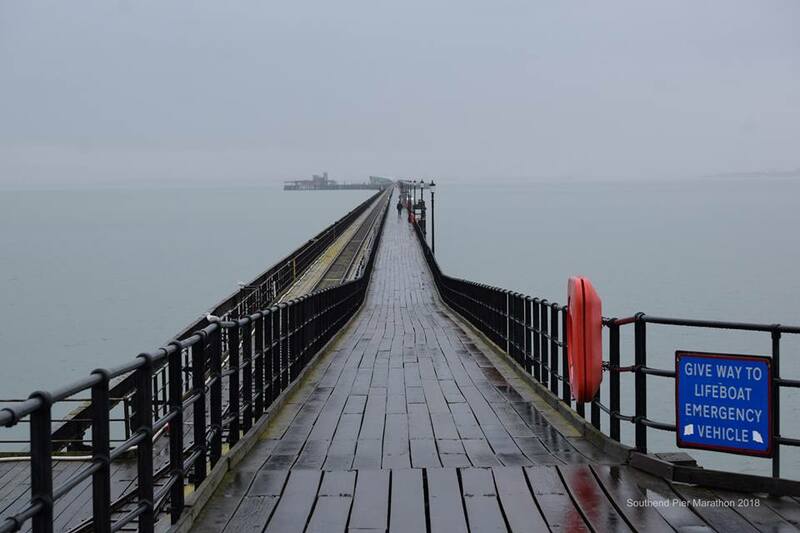 Not only that, this would be a world's first - the first marathon over the sea, along the world's longest pleasure pier. Exciting stuff! From social media reviews I think most people seemed to love the marathon, and will be returning next year, but I struggled. 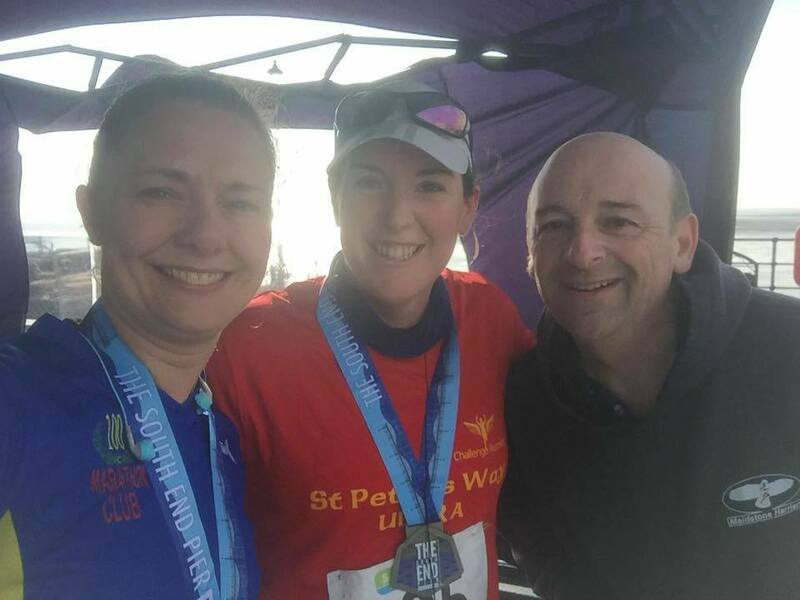 It was lovely to catch up with friends, and towards the end of the race in particular there was a developing camaraderie between those of us who were a bit slower and still out there, but after the first three laps which were quite fun, I stopped enjoying myself. I knew before I started though that this wouldn't be a race I'd be repeating - I'm not a fan of laps, especially really short ones (1.34miles up the pier, 1.34 miles down the pier) and the weather wasn't up to much - a bit cold, a bit drizzly. The pier isn't very inspiring either, and although the train that was running along beside us was a bit of a novelty, all in all I'd say it was a dull five hours. I envied the faster runners and it was great to see them as they lapped me (frequently!). The winner crossed the line in 2:48, an incredible 6:26/mile - inspiring to see proper running! The weather did improve though - by the time I finished it was glorious blue skies and sunshine...and in hindsight, maybe I'm so grumpy about the race because I was feeling so unfit. 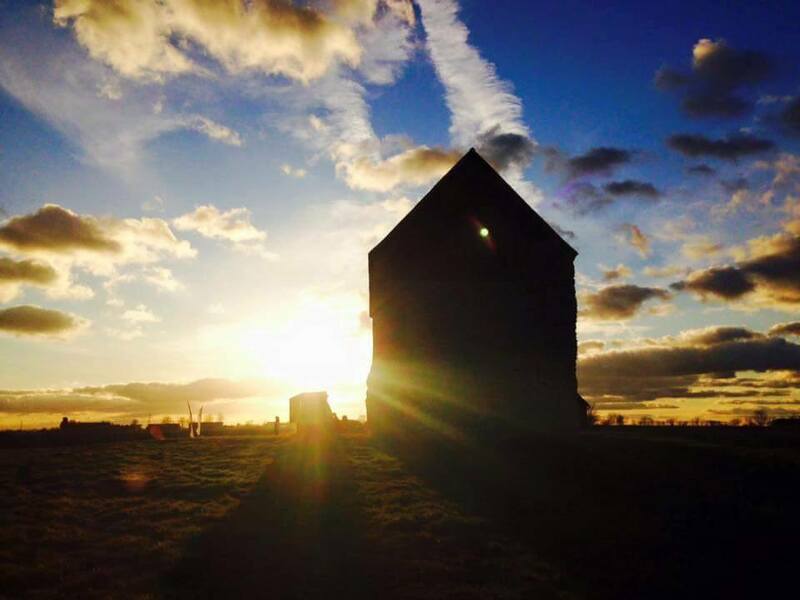 I hadn't run a step since the St Peter's Way two weeks earlier and by mid-way through I was hurting. Nothing really hurt at SPW, well not really and not for long, but my body was aching and creaking and generally I was pretty uncomfortable after only 15 miles on the pier. No undulation, no change to pace or rhythm unless I walked, and a lot of very solid wooden boards that at times made it feel like we were running on concrete were not the best combination for someone who really wasn't fit enough to be there. "Must do some training" needs to be my new mantra if I'm going to fare better at my next race! Leaving my grumpiness aside, the organisation and the event team couldn't be faulted - excellent aid station, beautiful medal, really friendly marshals. Added to which, because it was local, and laps, Francis drove down to see me with the girls and it was a lovely surprise to see him walking up the pier as I ran down. So, race #97 done (officially marathon/ultra #94) so another one down and closer to my 100th, and the bigger achievement of 100 official marathons that will earn me my 100 Marathon Club shirt. Hopefully that'll be October at Centurion's Autumn 100 miler. 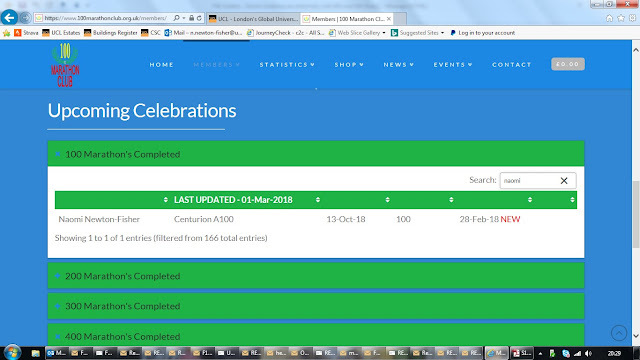 Now for that, I really am going to have to do some training: 207 days to go and counting! 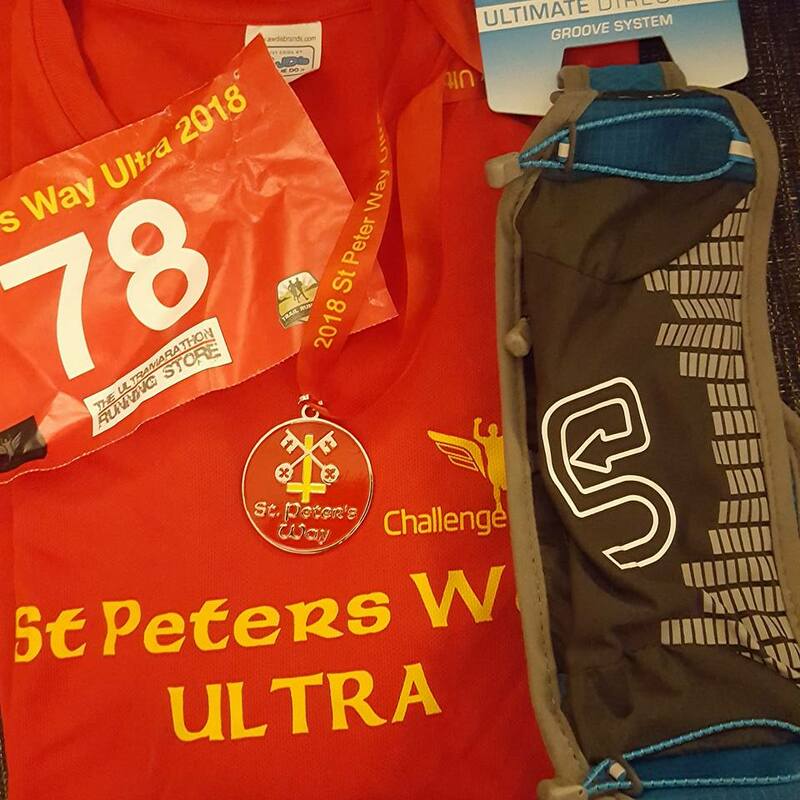 I ran the St Peter's Way ultra again a few weeks ago and it was probably the best year yet. It's obviously an event I love (why else would I run it five times?!) but was really nervous about this one as I'd barely run at all for a few weeks before the race, and wasn't entirely sure I'd be able to finish the distance. I'd struggled a bit just running a marathon distance in December at a GBC event, and so 43 miles on no training was a big ask. 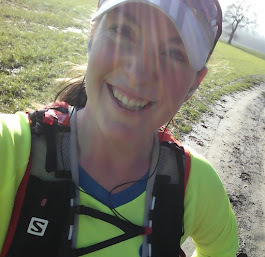 I was very close to pulling out, but as the day got closer, with the prospect of seeing friends I hadn't seen for months combined with a day out in some beautiful countryside, I decided that even if I DNF'ed, I would go along, and just enjoy however long I managed to stay out on the course. Bright and early on race morning, I drove off, leaving Francis to look after the girls. THANK YOU FRANCIS!! 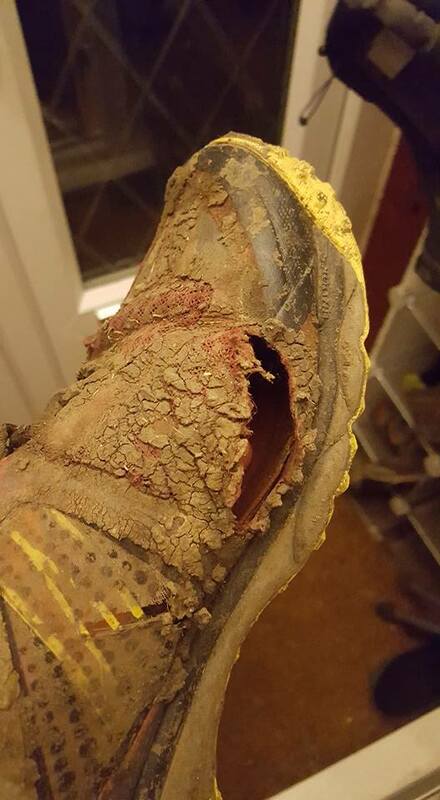 The St Peters Way race is usually ridiculously muddy. Freshly ploughed furrows, churned up horse enclosures and flooded fields have seen me losing a shoe in a previous race. It takes a certain amount of bravado and foolishness to run across all of that - luckily I have both and have always loved the muddy element of SPW. However, this year, everything (at least for most of the day) was frozen. With the ground hard under foot it felt like a different race, and there were some great finish times posted. It was certainly much easier going than it's been in previous years, if not quite the same challenge, although towards the end there were a few fields that you emerged from carrying half your body weight in sticky mud on your shoes...you could see on the path were everyone had stopped to try and scrape some of it away! It was obviously cold, but generally glorious. As usual I ran on my own, but towards the end there were a few of us leapfrogging each other - I often find that a bit frustrating, but on this occasion it was motivating, and quite nice to have some familiar faces around. I was amazed at how good I felt throughout. 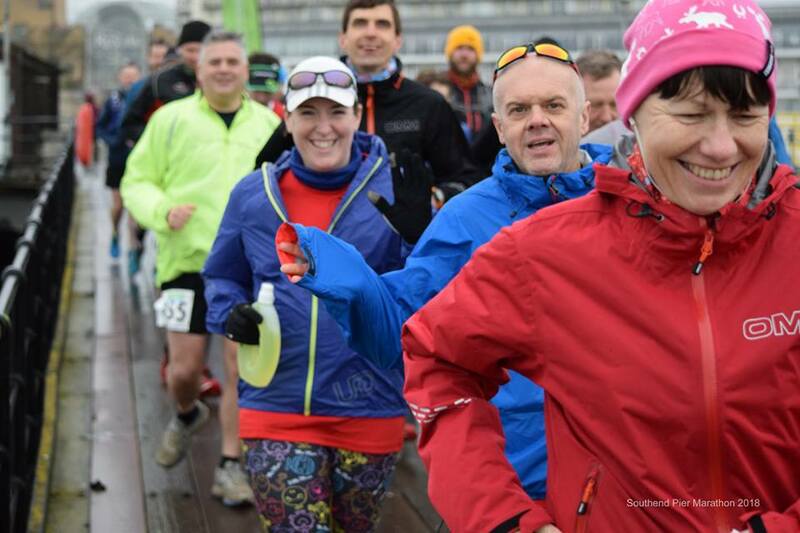 I had a few niggles, and a few bad patches, as you generally do on these races, and a couple of times, particularly early on, I wondered what on earth I was doing, but after about 20 miles I really settled into the run, and just loved it. The route felt familiar, and as we got further along, I realized that I might just make an earlier mini-bus back to the start than I'd previously expected...but that at the rate I was going I was probably going to miss it by about 10 minutes, which would then result in a 2hour wait for the next one! There was no way I could let that happen, so tried to stop faffing about and walking quite so much and started to run with a bit more focus. The last couple of miles of SPW can be hideous, along an incredibly exposed sea wall, with a icy biting wind, where you can see the finish but find yourself turning away from it as you follow the wall out to sea. It's pretty cruel...but the sun was low in the sky, and the view in-land was absolutely spectacular. Amazingly, I made the finish with about 5 minutes to spare until the bus, in an incredibly surprising time of 9hrs 9 minutes. My second slowest time, but with my lack of training that was no surprise at all. I was so happy to finish feeling strong and in control - no death march for me! Lindley gave me a spot-prize to celebrate my return to ultra running...my last ultra before falling pregnant was SPW, and this was my first proper one afterwards, and I got yet another SPW medal and tshirt combo! We headed off to the bus, and then I had a great 50 minute chat with a fellow runner all the way back to the start. It was a perfect day. Absolutely perfect. I was slower than I wanted to be, but much faster than I deserved to be and I had so much fun. I will be back again, next year.